Think of stars, fallen from the sky to land on green leaves. In April to June, flowers with five pointed petals, in shades of white to a pale sky-blue, appear in clusters on one-foot plants. The subtle hues give this perennial a peaceful presence in the garden. I love to visit botanic gardens (look for my previous posts under the category Gardening: Gardens). In addition to enjoying the beauty of these places, they also provide ideas for my own landscape. Denver’s is one of the best, and many of the plants there will grow happily 2,000 feet higher. But many won’t. The Betty Ford Alpine Garden, in Vail, is another lovely spot, but that garden features plants that only thrive in the mountains, where they enjoy exceptionally well-drained gravelly soils and cooler days. Yes, there are several demonstration gardens here in Colorado Springs, and I’m well acquainted with what they have to offer. But perhaps I’m too well acquainted. I need inspiration that I can apply at home. This summer, I found a botanic garden with growing conditions just like mine. In just five acres, the Yampa River Botanic Park, in Steamboat Springs, offers all the inspiration I could ask for. And since it’s situated at 6,800 feet, what grows there will grow for me, too. You’ve put out the jack-o’-lantern, there are mysterious eyes blinking in the hedge, and spider webs festoon the front porch. It’s almost time to greet thus year’s trick-or-treaters. You think you’re ready, but there’s a good chance that you’re missing the pièce de résistance, the perfect, spooky vine to frame your doorway. You need to plant Kintzley’s Ghost honeysuckle! This 2006 PlantSelect™ winner is the perfect plant for Colorado gardens, and not just because of its Halloween-evoking name. A cross between two Midwest natives, Lonicera reticulata (Grape Honeysuckle) and L. prolifera (Yellow Honeysuckle), this hybrid depends on weekly watering in more arid regions. Plants are hardy in USDA zone 4 through 8. Not fussy about soil, they thrive in full sun, but also tolerate afternoon shade. 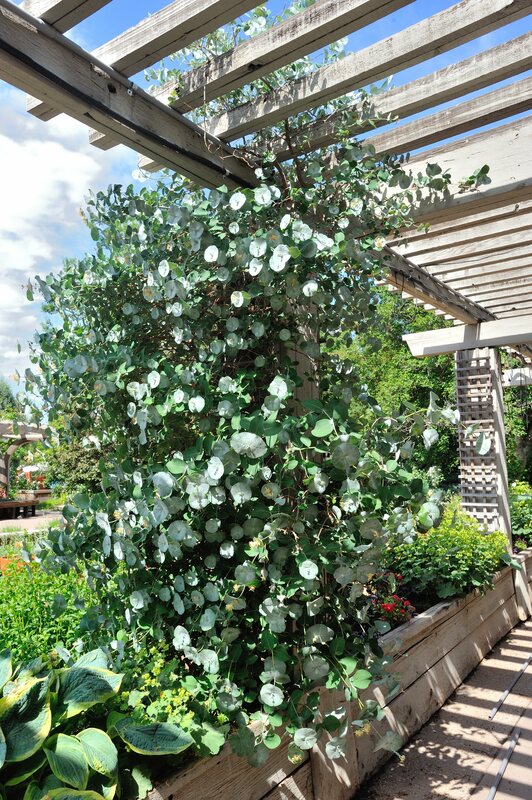 Another plus—the blue-green foliage is deer-resistant.